Amaya de los Santos survived the typhoon that left her an orphan. Now she scrapes by as an ice poacher, illegally harvesting fresh water for an always-thirsty market. But when she rescues an injured enemy soldier, she’s pulled into a storm of events more dangerous than any iceberg. After years of relying only on herself, she must learn to trust another…or risk losing all that’s left of her family…. 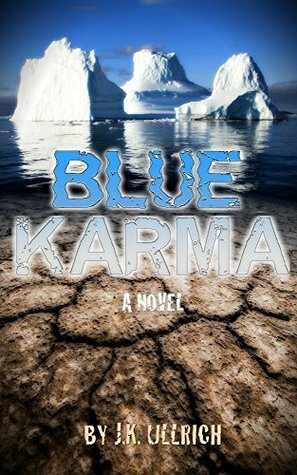 Blue Karma is a young adult scifi story set in an arid future where water is scarce and most of the water supply for North America is controlled by a corporation called Nilak. Amaya is an engee, an environmental refugee, and works with ice pirates to support herself and her little sister, Sayuri. After Amaya finds an injured Nilak guard on an iceberg she is working, she finds herself embroiled in events that quickly escalate out of her control, and she has to fight to keep herself, her sister, and maybe even the world’s water supply safe from harm. This is fast-moving novel, with a protagonist I could really root for. Amaya starts out bitter about the life she’s been given, but with reason. It takes her a while to warm up to and trust people, but she is fiercely loyal once she does. I couldn’t help but want the best for her and Sayuri. Young adult fans should enjoy this fun “cli-fi” story. Note: I received a free review copy from the author in exchange for an honest review. J.K. Ullrich likes to joke that she began writing environmental fiction at age six, when she won the local library’s Captain Planet essay contest. In the ensuing 20+ years, she earned a B.A. in English and pursued a successful career in analytical writing, although fiction remains her true passion. She published her first novel, Blue Karma, in 2015. When she’s not reading or writing, you can find her running on a favorite trail, jamming with a local cover band, or yelling at her baseball team.